New Delhi July 12 (IANS) Prime Minister Narendra Modi on Thursday said India should showcase its great heritage with pride and questioned rules that prohibit people from taking pictures at some monuments. 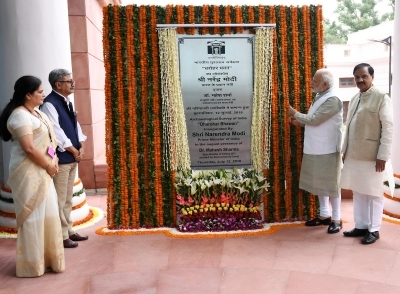 Inaugurating Dharohar Bhawan the new headquarters building of the Archaeological Survey of India (ASI) here Modi called for people s participation and involvement in protecting the country s archeological heritage. He said a mentality still prevails which does not allow people to take pride in their past achievements and noted that there should have been a change of such a mindset after Independence. "It is unfortunate that there is an entrenched mentality which feels that taking pride in our past glory is wrong. I feel till the time we have pride in our legacy in our past achievements we are also not fully involved in its conservation " Modi said. Modi referred to notices at some monuments asking people not to take pictures and said the times had changed and it was possible through technology to zero in on a neighbourhood. "Using space technology you can know what is the number of a scooter parked in an area of Delhi. But on the board of monument it is written that photography is prohibited. Time has changed technology has changed." Recalling his experience as Gujarat chief minister Modi said that he gave instructions to withdraw notice that prevented people from taking pictures at Sardar Sarovar dam. He said there was good response and ticketing was done later. Modi said corporate sector can also be involved in the task of archaeological conservation and people can contribute some hours as volunteers. He said school syllabus in cities that have archeological sites can include information on these places so that students can learn about them. Modi said the youth can be encouraged to work as guides and recalled that he had suggested holding a best guide talent competition on TV channels to nurture interest in people. He said like some foreign countries senior citizens in India can also form clubs and work as guides. The Prime Minister said the ASI had performed significant work over the last 150 years and each archaeological discovery painstakingly made by archaeologists over long periods of time had its own story to tell. "India should showcase its great heritage with pride and confidence to the world " he said. Modi recalled his meeting with Haibhai Godani who had made a rich and memorable collection of artefacts through sustained personal efforts. The new headquarters of ASI is equipped with modern facilities including energy efficient lighting and rainwater harvesting. It has a Central Archaeological Library with a collection of about 1.5 lakh books and journals.